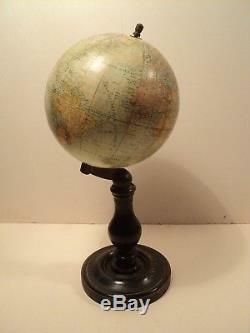 Old world globe Napoleonic period iii g. Dimensions: height 31.5cm, globe diameter 14cm, base 11.5cm. Very good condition, beautiful patina. Slight wear at the junction of the globe and foot, it should be added a washer for finishing. The item "old globe epoch napoleon III G. Thomas publisher paris" is on sale since Tuesday, May 29, 2018. It is in the category "art, antiquities \ objects of the nineteenth and before". The seller is "tonalli69" and is located in France. This item can be shipped to the following country: europe.